» Traffic jams on I-5: More signs? Traffic jams on I-5: More signs? 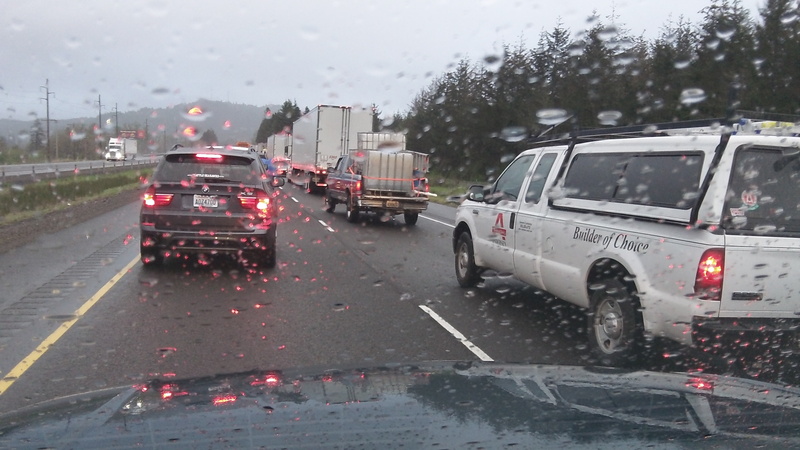 In reaction to a massive traffic jam Sunday, ODOT has asked drivers to avoid a work zone on Interstate 5 south of Cottage Grove during peak traffic periods or to find alternate routes. Unfortunately, there are no practical alternatives, so ODOT might want to try something else to help drivers either avoid or cope with delays. My suggestion: Set up reader boards many miles from the congestion zone to warn drivers in plenty of time that there’s a backup south of Cottage Grove. That would give people a chance to get off the freeway, grab a bite to eat, make a rest stop or otherwise wait until the jam is cleared. On the way south, those boards could be set up before Springfield or even Coburg, and before Roseburg or Sutherlin on the way north. In March, I saw a sign like that on I-5 in Los Angeles. It warned that the four left lanes were blocked about 30 miles ahead. I did not, alas, heed the warning, so we got stuck for a while. But at least the warning was there. Signs like that also might give motorists an idea of the length of the delay they are facing. On Sunday, ODOT says, after a truck crash in the construction zone south of Cottage Grove, traffic was backed up for 10 miles, and some people were stuck there for two hours. A couple of weeks before, I got caught in a much shorter backup near that area. Having some information about the expected length of the holdup would have made even that relatively short wait much easier to take. What’s happening on I-5 south of Cottage Grove is that lanes are restricted so that several miles of concrete paving can be replaced. The final phase of that job began on April 6, and ODOT expects it to be finished in May. ODOT says most delays have happened on weekday and Sunday afternoons.